Nobody had a suggested topic starting with ‘W’ for me! So I’ll take that as a free choice, and get lightly autobiogrpahical. I know I encountered the Witch of Agnesi while in middle school. Eighth grade, if I’m not mistaken. It was a footnote in a textbook. I don’t remember much of the textbook. What I mostly remember of the course was how much I did not fit with the teacher. The only relief from boredom that year was the month we had a substitute and the occasional interesting footnote. In a weird tantalizing moment the footnote didn’t offer a picture. Or say what an ‘a’ was doing in there. In retrospect I recognize ‘a’ as a parameter, and that different values of it give different but related shapes. No hint what the ‘8’ or the ‘4’ were doing there. Nor why ‘a’ gets raised to the third power in the numerator or the second in the denominator. I did my best with the tools I had at the time. Picked a nice easy boring ‘a’. Picked out values of ‘x’ and found the corresponding ‘y’ which made the equation true, and tried connecting the dots. The result didn’t look anything like a witch. Nor a witch’s hat. It was one of a handful of biographical notes in the book. These were a little attempt to add some historical context to mathematics. It wasn’t much. But it was an attempt to show that mathematics came from people. Including, here, from Maria Gaëtana Agnesi. She was, I’m certain, the only woman mentioned in the textbook I’ve otherwise completely forgotten. We have few names of ancient mathematicians. Those we have are often compilers like Euclid whose fame obliterated the people whose work they explained. Or they’re like Pythagoras, credited with discoveries by people who obliterated their own identities. In later times we have the mathematics done by, mostly, people whose social positions gave them time to write mathematics results. So we see centuries where every mathematician is doing it as their side hustle to being a priest or lawyer or physician or combination of these. Women don’t get the chance to stand out here. Today of course we can name many women who did, and do, mathematics. We can name Emmy Noether, Ada Lovelace, and Marie-Sophie Germain. Challenged to do a bit more, we can offer Florence Nightingale and Sofia Kovalevskaya. Well, and also Grace Hopper and Margaret Hamilton if we decide computer scientists count. Katherine Johnson looks likely to make that cut. But in any case none of these people are known for work understandable in a pre-algebra textbook. This must be why Agnesi earned a place in this book. She’s among the earliest women we can specifically credit with doing noteworthy mathematics. (Also physics, but that’s off point for me.) Her curve might be a little advanced for that textbook’s intended audience. But it’s not far off, and pondering questions like “why ? Why not ?” is more pleasant, to a certain personality, than pondering what a directrix might be and why we might use one. The equation might be a lousy way to visualize the curve described. The curve is one of that group of interesting shapes you get by constructions. That is, following some novel process. Constructions are fun. They’re almost a craft project. For this we start with a circle. And two parallel tangent lines. Without loss of generality, suppose they’re horizontal, so, there’s lines at the top and the bottom of the curve. Take one of the two tangent points. Again without loss of generality, let’s say the bottom one. Draw a line from that point over to the other line. Anywhere on the other line. There’s a point where the line you drew intersects the circle. There’s another point where it intersects the other parallel line. We’ll find a new point by combining pieces of these two points. The point is on the same horizontal as wherever your line intersects the circle. It’s on the same vertical as wherever your line intersects the other parallel line. This point is on the Witch of Agnesi curve. Now draw another line. Again, starting from the lower tangent point and going up to the other parallel line. Again it intersects the circle somewhere. This gives another point on the Witch of Agnesi curve. Draw another line. Another intersection with the circle, another intersection with the opposite parallel line. Another point on the Witch of Agnesi curve. And so on. Keep doing this. When you’ve drawn all the lines that reach from the tangent point to the other line, you’ll have generated the full Witch of Agnesi curve. This takes more work than writing out , yes. But it’s more fun. It makes for neat animations. And I think it prepares us to expect the shape of the curve. It’s a neat curve. Between it and the lower parallel line is an area four times that of the circle that generated it. The shape is one we would get from looking at the derivative of the arctangent. So there’s some reasons someone working in calculus might find it interesting. And people did. Pierre de Fermat studied it, and found this area. Isaac Newton and Luigi Guido Grandi studied the shape, using this circle-and-parallel-lines construction. Maria Agnesi’s name attached to it after she published a calculus textbook which examined this curve. She showed, according to people who present themselves as having read her book, the curve and how to find it. And she showed its equation and found the vertex and asymptote line and the inflection points. The inflection points, here, are where the curve chances from being cupped upward to cupping downward, or vice-versa. It’s a neat function. It’s got some uses. It’s a natural smooth-hill shape, for example. So this makes a good generic landscape feature if you’re modeling the flow over a surface. I read that solitary waves can have this curve’s shape, too. And the curve turns up as a probability distribution. Take a fixed point. Pick lines at random that pass through this point. See where those lines reach a separate, straight line. Some regions are more likely to be intersected than are others. Chart how often any particular line is the new intersection point. That chart will (given some assumptions I ask you to pretend you agree with) be a Witch of Agnesi curve. This might not surprise you. It seems inevitable from the circle-and-intersecting-line construction process. And that’s nice enough. As a distribution it looks like the usual Gaussian bell curve. It’s different, though. And it’s different in strange ways. Like, for a probability distribution we can find an expected value. That’s … well, what it sounds like. But this is the strange probability distribution for which the law of large numbers does not work. Imagine an experiment that produces real numbers, with the frequency of each number given by this distribution. Run the experiment zillions of times. What’s the mean value of all the zillions of generated numbers? And it … doesn’t … have one. I mean, we know it ought to, it should be the center of that hill. But the calculations for that don’t work right. Taking a bigger sample makes the sample mean jump around more, not less, the way every other distribution should work. It’s a weird idea. Imagine carving a block of wood in the shape of this curve, with a horizontal lower bound and the Witch of Agnesi curve as the upper bound. Where would it balance? … The normal mathematical tools don’t say, even though the shape has an obvious line of symmetry. And a finite area. You don’t get this kind of weirdness with parabolas. It teaches us more strange things, though. Consider interpolations, that is, taking a couple data points and fitting a curve to them. We usually start out looking for polynomials when we interpolate data points. This is because everything is polynomials. Toss in more data points. We need a higher-order polynomial, but we can usually fit all the given points. But sometimes polynomials won’t work. A problem called Runge’s Phenomenon can happen, where the more data points you have the worse your polynomial interpolation is. The Witch of Agnesi curve is one of those. Carl Runge used points on this curve, and trying to fit polynomials to those points, to discover the problem. More data and higher-order polynomials make for worse interpolations. You get curves that look less and less like the original Witch. Runge is himself famous to mathematicians, known for “Runge-Kutta”. That’s a family of techniques to solve differential equations numerically. I don’t know whether Runge came to the weirdness of the Witch of Agnesi curve from considering how errors build in numerical integration. I can imagine it, though. The topics feel related to me. I understand how none of this could fit that textbook’s slender footnote. I’m not sure any of the really good parts of the Witch of Agnesi could even fit thematically in that textbook. At least beyond the fact of its interesting name, which any good blog about the curve will explain. That there was no picture, and that the equation was beyond what the textbook had been describing, made it a challenge. Maybe not seeing what the shape was teased the mathematician out of this bored student. And next is ‘X’. Will I take Mr Wu’s suggestion and use that to describe something “extreme”? Or will I take another topic or suggestion? We’ll see on Friday, barring unpleasant surprises. Thanks for reading. Were Story Problems Ever Any Good? I have been reading Mapping In Michigan and the Great Lakes Region, edited by David I Macleod, because — look, I understand that I have a problem. I just live with it. The book is about exactly what you might imagine from the title. And it features lots of those charming old maps where, you know, there wasn’t so very much hard data available and everyone did the best with what they had. So you get these maps with spot-on perfect Lake Eries and the eastern shore of Lake Huron looking like you pulled it off of Open Street Maps. And then Michigan looks like a kid’s drawing of a Thanksgiving turkey. Also sometimes they drop a mountain range in the middle of the state because I guess it seemed a little empty without. Karpinski disparaged the typical “story problems” found in contemporary textbooks, such as the following: “How many sacks, holding 2 bushels, 3 pecks and 2 quarts each can be filled from a bin containing 366 bushels, 3 pecks, 4 quarts of what?” Karpinski comments: “How carefully would you have to fill a sack to make it hold 3 pecks 2 quarts of anything? And who filled the bin so marvelously that the capacity is known with an accuracy of one-25th of 1% of the total?” He recommended an easier, more practical means of doing such problems, noting that a bushel is about 1 & 1/4 or 5/4 cubic feet. Therefore the number of bushels in the bin is the length times width times 4/5; the easiest way to get 4/5 of anything is to take away one-fifth of it. This does read to me like Pedley jumped a track somewhere. It seems to go from the demolition of the plausibility of one problem’s setup to demolishing the plausibility of how to answer a problem. Still, the core complaint is with us yet. It’s hard to frame problems that might actually come up in ways that clearly test specific mathematical skills. And on another note. This is the 1,000th mathematical piece that I’ve published since I started in September of 2011. If I’m not misunderstanding this authorship statistic on WordPress, which is never a safe bet. I’m surprised that it has taken as long as this to get to a thousand posts. Also I’m surprised that I should be surprised. I know roughly how many days there are in a year. And I know I need special circumstances to post something more often than every other day. Still, I’m glad to reach this milestone, and gratified that there’s anyone interested in what I have to say. In my next thousand posts I hope to say something. Author Joseph NebusPosted on Saturday, 3 March, 2018 Saturday, 3 March, 2018 Categories Math, Mathematics, Maths, MetaTags maps, mathematics history, story problems, word problems4 Comments on Were Story Problems Ever Any Good? So, I must confess failure. Not about deciphering Józef Maria Hoëne-Wronski’s attempted definition of π. He’d tried this crazy method throwing a lot of infinities and roots of infinities and imaginary numbers together. I believe I translated it into the language of modern mathematics fairly. And my failure is not that I found the formula actually described the number -½π. Oh, I had an error in there, yes. And I’d found where it was. It was all the way back in the essay which first converted Wronski’s formula into something respectable. It was a small error, first appearing in the last formula of that essay and never corrected from there. This reinforces my suspicion that when normal people see formulas they mostly look at them to confirm there is a formula there. With luck they carry on and read the sentences around them. My failure is I wanted to write a bit about boring mistakes. The kinds which you make all the time while doing mathematics work, but which you don’t worry about. Dropped signs. Constants which aren’t divided out, or which get multiplied in incorrectly. Stuff like this which you only detect because you know, deep down, that you should have gotten to an attractive simple formula and you haven’t. Mistakes which are tiresome to make, but never make you wonder if you’re in the wrong job. The trouble is I can’t think of how to make an essay of that. We don’t tend to rate little mistakes like the wrong sign or the wrong multiple or a boring unnecessary added constant as important. This is because they’re not. The interesting stuff in a mathematical formula is usually the stuff representing variations. Change is interesting. The direction of the change? Eh, nice to know. A swapped plus or minus sign alters your understanding of the direction of the change, but that’s all. Multiplying or dividing by a constant wrongly changes your understanding of the size of the change. But that doesn’t alter what the change looks like. Just the scale of the change. Adding or subtracting the wrong constant alters what you think the change is varying from, but not what the shape of the change is. Once more, not a big deal. But you also know that instinctively, or at least you get it from seeing how it’s worth one or two points on an exam to write -sin where you mean +sin. Or how if you ask the instructor in class about that 2 where a ½ should be, she’ll say, “Oh, yeah, you’re right” and do a hurried bit of erasing before going on. Thus my failure: I don’t know what to say about boring mistakes that has any insight. Because with that form in mind, it’s easy to take the stuff in curled braces and the in the denominator. From that we get, correctly, . And then the on the far left of that expression and the on the right multiply together to produce the number 8. All right, there’s an extra factor of 2 here. And I don’t think that is my mistake. Or if it is, other people come to the same mistake without my prompting. Possibly the book I drew this from misquoted Wronski. It’s at least as good to have a formula for 2π as it is to have one for π. Or Wronski had a mistake in his original formula, and had a constant multiplied out front which he didn’t want. It happens to us all. I had thought I’d culled some more pieces from my Twitter and other mathematics-writing-reading the last couple weeks and I’m not sure where it all went. I think I might be baffled by the repostings of things on Quanta Magazine (which has a lot of good mathematics articles, but not, like, a 3,000-word piece every day, and they showcase their archive just as anyone ought). It reviews Kim Plofker’s 2008 text Mathematics In India , a subject that I both know is important — I love to teach with historic context included — and something that I very much bluff my way through. I mean, I do research things I expect I’ll mention, but I don’t learn enough of the big picture and a determined questioner could prove how fragile my knowledge was. So Plofker’s book should go on my reading list at least. These are lecture notes about analysis. In the 19th century mathematicians tried to tighten up exactly what we meant by things like “functions” and “limits” and “integrals” and “numbers” and all that. It was a lot of good solid argument, and a lot of surprising, intuition-defying results. This isn’t something that a lay reader’s likely to appreciate, and I’m sorry for that, but if you do know the difference between Riemann and Lebesgue integrals the notes are likely to help. And this, Daniel Grieser and Svenja Maronna’s Hearing The Shape Of A Triangle , follows up on a classic mathematics paper, Mark Kac’s Can One Hear The Shape Of A Drum ? This is part of a class of problems in which you try to reconstruct what kinds of things can produce a signal. It turns out to be impossible to perfectly say what shape and material of a drum produced a certain sound of a drum. But. A triangle — the instrument, that is, but also the shape — has a simpler structure. Could we go from the way a triangle sounds to knowing what it looks like? And I mentioned this before but if you want to go reading every Calvin and Hobbes strip to pick out the ones that mention mathematics, you can be doing someone a favor too. The trouble is that limit took more work than I wanted to do to evaluate. If you try evaluating that ‘f(x)’ at ∞, you get an expression that looks like zero times ∞. This begs for the use of L’Hôpital’s Rule, which tells you how to find the limit for something that looks like zero divided by zero, or like ∞ divided by ∞. Do a little rewriting — replacing that first ‘x’ with ‘ — and this ‘f(x)’ behaves like L’Hôpital’s Rule needs. The trouble is, that’s a pain to evaluate. L’Hôpital’s Rule works on functions that look like one function divided by another function. It does this by calculating the derivative of the numerator function divided by the derivative of the denominator function. And I decided that was more work than I wanted to do. Where trouble comes up is all those parts where turns up. The derivatives of functions with a lot of terms in them get more complicated than the original functions were. Is there a way to get rid of some or all of those? The limit of ‘f(x)’ for ‘x’ at ∞ should be the same number as the limit of ‘g(y)’ for ‘y’ at … you’d really like it to be zero. If ‘x’ is incredibly huge, then has to be incredibly small. But we can’t just swap the limit of ‘x’ at ∞ for the limit of ‘y’ at 0. The limit of a function at a point reflects the value of the function at a neighborhood around that point. If the point’s 0, this includes positive and negative numbers. But looking for the limit at ∞ gets at only positive numbers. You see the difference? The first derivative of the denominator is blessedly easy: the derivative of y, with respect to y, is 1. The derivative of the numerator is a little harder. It demands the use of the Product Rule and the Chain Rule, just as last time. But these chains are easier. is 0. And the sine of 0 is 0. The cosine of 0 is 1. So all this gets to be a lot simpler, really fast. … So, what Wronski had been looking for, originally, was π. This is … oh, so very close to right. I mean, there’s π right there, it’s just multiplied by an unwanted . The question is, where’s the mistake? Was Wronski wrong to start with? Did I parse him wrongly? Is it possible that the book I copied Wronski’s formula from made a mistake? Could be any of them. I’d particularly suspect I parsed him wrongly. I returned the library book I had got the original claim from, and I can’t find it again before this is set to publish. But I should check whether Wronski was thinking to find π, the ratio of the circumference to the diameter of a circle. Or might he have looked to find the ratio of the circumference to the radius of a circle? Either is an interesting number worth finding. We’ve settled on the circumference-over-diameter as valuable, likely for practical reasons. It’s much easier to measure the diameter than the radius of a thing. (Yes, I have read the Tau Manifesto. No, I am not impressed by it.) But if you know 2π, then you know π, or vice-versa. The next question: yeah, but I turned up -½π. What am I talking about 2π for? And the answer there is, I’m not the first person to try working out Wronski’s stuff. You can try putting the expression, as best you parse it, into a tool like Mathematica and see what makes sense. Or you can read, for example, Quora commenters giving answers with way less exposition than I do. And I’m convinced: somewhere along the line I messed up. Not in an important way, but, essentially, doing something equivalent to divided by -2 when I should have multiplied by that. I’ve spotted my mistake. I figure to come back around to explaining where it is and how I made it. I’m slow about sharing them is all. It’s a simple dynamic: I want to write enough about each tweet that it’s interesting to share, and then once a little time has passed, I need to do something more impressive to be worth the wait. Eventually, nothing is ever shared. Let me try to fix that. Just as it says: a link to Leonhard Euler’s Elements of Algebra, as rendered by Google Books. Euler you’ll remember from every field of mathematics ever. This 1770 textbook is one of the earliest that presents algebra that looks like, you know, algebra, the way we study it today. Much of that is because this book presented algebra so well that everyone wanted to imitate it. An entry in the amusing and novel proofs. This one is John Conway’s candidate for most succinct published mathematics paper. It’s fun, at least as I understand fun to be. This Theorem of the Day from back in November already is one about elliptic functions. Those came up several times in the Summer 2017 Mathematics A To Z. This day about the Goins-Maddox-Rusin Theorem on Heron Triangles, is dense reading even by the standards of the Theorem of the Day tweet (which fits each day’s theorem into a single slide). Still, it’s worth lounging about in the mathematics. Elke Stangl, writing about one of those endlessly-to-me interesting subjects: phase space. This is a particular way of representing complicated physical systems. Set it up right and all sorts of physics problems become, if not easy, at least things there’s a standard set of tools for. Thermodynamics really encourages learning about such phase spaces, and about entropy, and here she writes about some of this. Non-limit calculating e by hand. https://t.co/Kv80RotboJ Fun activity & easily reproducible. Anyone know the author? So ‘e’ is an interesting number. At least, it’s a number that’s got a lot of interesting things built around it. Here, John Golden points out a neat, fun, and inefficient way to find the value of ‘e’. It’s kin to that scheme for calculating π inefficiently that I was being all curmudgeonly about a couple of Pi Days ago. Jo Morgan comes to the rescue of everyone who tries to read old-time mathematics. There were a lot of great and surprisingly readable great minds publishing in the 19th century, but then you get partway through a paragraph and it might as well be Old High Martian with talk about diminishings and consequents and so on. So here’s some help. As it says on the tin: a textbook on partial differential equations. If you find yourself adrift in the subject, maybe seeing how another author addresses the same subject will help, if nothing else for finding something familiar written in a different fashion. And this is just fun: creating an ellipse as the locus of points that are never on the fold line when a circle’s folded by a particular rule. Finally, something whose tweet origin I lost. It was from one of the surprisingly many economists I follow considering I don’t do financial mathematics. But it links to a bit of economic history: Origins of the Sicilian Mafia: The Market for Lemons . It’s 31 pages plus references. And more charts about wheat production in 19th century Sicily than I would have previously expected to see. By the way, if you’re interested in me on Twitter, that would be @Nebusj. Thanks for stopping in, should you choose to. Because the limit of ‘x’, for ‘x’ at ∞, is infinitely large. The limit of ‘ ‘ for ‘x’ at ∞ is 1. The limit of ‘ for ‘x’ at ∞ is 0. We can take limits that are 0, or limits that are some finite number, or limits that are infinitely large. But multiplying a zero times an infinity is dangerous. Could be anything. That ‘ mark is a common shorthand for “the first derivative of this function, with respect to the only variable we have around here”. This doesn’t look like it should help matters. Often it does, though. There’s an excellent chance that either ‘h'(x)’ or ‘g'(x)’ — or both — aren’t simultaneously zero, or ∞, at ‘a’. And once that’s so, we’ve got a meaningful limit. This doesn’t always work. Sometimes we have to use this l’Hôpital’s Rule trick a second time, or a third or so on. But it works so very often for the kinds of problems we like to do. Reaches the point that if it doesn’t work, we have to suspect we’re calculating the wrong thing. But wait, you protest, reasonably. This is fine for problems where the limit looks like 0 divided by 0, or ∞ divided by ∞. What Wronski’s formula got me was 0 times 1 times ∞. And I won’t lie: I’m a little unsettled by having that 1 there. I feel like multiplying by 1 shouldn’t be a problem, but I have doubts. That zero times ∞ thing, thought? That’s easy. Here’s the second trick. Let me put it this way: isn’t ‘x’ really the same thing as ? I expect your answer is to slam your hand down on the table and glare at my writing with contempt. So be it. I told you it was a trick. And it’s a perfectly good one. And it’s perfectly legitimate, too. is a meaningful number if ‘x’ is any finite number other than zero. So is . Mathematicians accept a definition of limit that doesn’t really depend on the value of your expression at a point. So that wouldn’t be meaningful for ‘x’ at zero doesn’t mean we can’t evaluate its limit for ‘x’ at zero. And just because we might not be sure that would mean for infinitely large ‘x’ doesn’t mean we can’t evaluate its limit for ‘x’ at ∞. I see you, person who figures you’ve caught me. The first thing I tried was putting in the value of ‘x’ at the ∞, all ready to declare that this was the limit of ‘f(x)’. I know my caveats, though. Plugging in the value you want the limit at into the function whose limit you’re evaluating is a shortcut. If you get something meaningful, then that’s the same answer you would get finding the limit properly. Which is done by looking at the neighborhood around but not at that point. So that’s why this reciprocal-of-the-reciprocal trick works. Do I want to replace ‘x’ with , or do I want to replace with ? I was going to say something about how many times in my life I’ve been glad to take the reciprocal of the sine of an expression of x. But just writing the symbols out like that makes the case better than being witty would. I put that -2 out in front because it’s not really important. The limit of a constant number times some function is the same as that constant number times the limit of that function. We can put that off to the side, work on other stuff, and hope that we remember to bring it back in later. I manage to remember it about four-fifths of the time. The derivative for ‘h(x)’ is a little more involved. ‘h(x)’ we can write as the product of two expressions, that and that . And each of those expressions contains within themselves another expression, that . So this is going to require the Product Rule, of two expressions that each require the Chain Rule. Yeah I’m not finishing that. Too much work. I’m going to reluctantly try thinking instead. And find its limit when ‘x’ is ∞. Formally, you want to do this by proving there’s some number, let’s say ‘L’. And ‘L’ has the property that you can pick any margin-of-error number ε that’s bigger than zero. And whatever that ε is, there’s some number ‘N’ so that whenever ‘x’ is bigger than ‘N’, ‘f(x)’ is larger than ‘L – ε’ and also smaller than ‘L + ε’. This can be a lot of mucking about with expressions to prove. The sine of 0 is 0. 20 is 1. So substitution tells us limit is -2 times ∞ times 1 times 0. That there’s an ∞ in there isn’t a problem. A limit can be infinitely large. Think of the limit of ‘x2‘ at ∞. An infinitely large thing times an infinitely large thing is fine. The limit of ‘x ex‘ at ∞ is infinitely large. A zero times a zero is fine; that’s zero again. But having an ∞ times a 0? That’s trouble. ∞ times something should be huge; anything times zero should be 0; which term wins? So we have to fall back on alternate plans. Fortunately there’s a tool we have for limits when we’d otherwise have to face an infinitely large thing times a zero. I hope to write about this next time. I apologize for not getting through it today but time wouldn’t let me. So. I don’t want to deal with that f(x) as it’s written. I can make it better. One thing that bothers me is seeing the complex number raised to a power. I’d like to work with something simpler than that. And I can’t see that number without also noticing that I’m subtracting from it raised to the same power. and are a “conjugate pair”. It’s usually nice to see those. It often hints at ways to make your expression simpler. That’s one of those patterns you pick up from doing a lot of problems as a mathematics major, and that then look like magic to the lay audience. Here’s the first way I figure to make my life simpler. It’s in rewriting that and stuff so it’s simpler. It’ll be simpler by using exponentials. Shut up, it will too. I get there through Gauss, Descartes, and Euler. At least I think it was Gauss who pointed out how you can match complex-valued numbers with points on the two-dimensional plane. On a sheet of graph paper, if you like. The number matches to the point with x-coordinate 1, y-coordinate 1. The number matches to the point with x-coordinate 1, y-coordinate -1. Yes, yes, this doesn’t sound like much of an insight Gauss had, but his work goes on. I’m leaving it off here because that’s all that I need for right now. The other good choice is polar coordinates. For that we need an origin and a positive x-axis. We refer to points by how far they are from the origin, heedless of direction. And then to get direction, what angle the line segment connecting the point with the origin makes with the positive x-axis. The first of these numbers, the distance, we normally label ‘r’ unless there’s compelling reason otherwise. The other we label ‘θ’. ‘r’ is always going to be a positive number or, possibly, zero. ‘θ’ might be any number, positive or negative. By convention, we measure angles so that positive numbers are counterclockwise from the x-axis. I don’t know why. I guess it seemed less weird for, say, the point with Cartesian coordinates (0, 1) to have a positive angle rather than a negative angle. That angle would be , because mathematicians like radians more than degrees. They make other work easier. So. The point corresponds to the polar coordinates and . The point corresponds to the polar coordinates and . Yes, the θ coordinates being negative one times each other is common in conjugate pairs. Also, if you have doubts about my use of the word “the” before “polar coordinates”, well-spotted. If you’re not sure about that thing where ‘r’ is not negative, again, well-spotted. I intend to come back to that. With the polar coordinates ‘r’ and ‘θ’ to describe a point I can go back to complex numbers. I can match the point to the complex number with the value given by , where ‘e’ is that old 2.71828something number. Superficially, this looks like a big dumb waste of time. I had some problem with imaginary numbers raised to powers, so now, I’m rewriting things with a number raised to imaginary powers. Here’s why it isn’t dumb. It’s easy to raise a number written like this to a power. raised to the n-th power is going to be equal to . (Because and we’re going to go ahead and assume this stays true if ‘b’ is a complex-valued number. It does, but you’re right to ask how we know that.) And this turns into raising a real-valued number to a power, which we know how to do. And it involves dividing a number by that power, which is also easy. And we can get back to something that looks like too. That is, something that’s a real number plus times some real number. This is through one of the many Euler’s Formulas. The one that’s relevant here is that for any real number ‘φ’. So, that’s true also for ‘θ’ times ‘n’. Or, looking to where everybody knows we’re going, also true for ‘θ’ divided by ‘x’. OK, on to the people so anxious about all this. I talked about the angle made between the line segment that connects a point and the origin and the positive x-axis. “The” angle. “The”. If that wasn’t enough explanation of the problem, mention how your thinking’s done a 360 degree turn and you see it different now. In an empty room, if you happen to be in one. Your pedantic know-it-all friend is explaining it now. There’s an infinite number of angles that correspond to any given direction. They’re all separated by 360 degrees or, to a mathematician, 2π. And more. What’s the difference between going out five units of distance in the direction of angle 0 and going out minus-five units of distance in the direction of angle -π? That is, between walking forward five paces while facing east and walking backward five paces while facing west? Yeah. So if we let ‘r’ be negative we’ve got twice as many infinitely many sets of coordinates for each point. This complicates raising numbers to powers. θ times n might match with some point that’s very different from θ-plus-2-π times n. There might be a whole ring of powers. This seems … hard to work with, at least. But it’s, at heart, the same problem you get thinking about the square root of 4 and concluding it’s both plus 2 and minus 2. If you want “the” square root, you’d like it to be a single number. At least if you want to calculate anything from it. You have to pick out a preferred θ from the family of possible candidates. For me, that’s whatever set of coordinates has ‘r’ that’s positive (or zero), and that has ‘θ’ between -π and π. Or between 0 and 2π. It could be any strip of numbers that’s 2π wide. Pick what makes sense for the problem you’re doing. It’s going to be the strip from -π to π. Perhaps the strip from 0 to 2π. And that’s the function whose limit I want to take at ∞. No, really. I ran out of time to do my next bit on Wronski’s attempted definition of π. Next week, all goes well. But I have something to share anyway. William Lane Craig, of the The author of Boxing Pythagoras blog was intrigued by the starting point. And as a fan of studying how people understand infinity and infinitesimals (and how they don’t), this two-century-old example of mixing the numerous and the tiny set his course. So here’s his essay, trying to work out Wronski’s beautiful weird formula from a non-standard analysis perspective. Non-standard analysis is a field that’s grown in the last fifty years. It’s probably fairly close in spirit to what (I think) Wronski might have been getting at, too. Non-standard analysis works with ideas that seem to match many people’s intuitive feelings about infinitesimals and infinities. For example, can we speak of a number that’s larger than zero, but smaller than the reciprocal of any positive integer? It’s hard to imagine such a thing. But what if we can show that if we suppose such a number exists, then we can do this logically sound work with it? If you want to say that isn’t enough to show a number exists, then I have to ask how you know imaginary numbers or negative numbers exist. Standard analysis, you probably guessed, doesn’t do that. It developed over the 19th century when the logical problems of these kinds of numbers seemed unsolvable. Mostly that’s done by limits, showing that a thing must be true whenever some quantity is small enough, or large enough. It seems safe to trust that the infinitesimally small is small enough, and the infinitely large is large enough. And it’s not like mathematicians back then were bad at their job. Mathematicians learned a lot of things about how infinitesimals and infinities work over the late 19th and early 20th century. It makes modern work possible. Anyway, Boxing Pythagoras goes over what a non-standard analysis treatment of the formula suggests. I think it’s accessible even if you haven’t had much non-standard analysis in your background. At least it worked for me and I haven’t had much of the stuff. I think it’s also accessible if you’re good at following logical argument and won’t be thrown by Greek letters as variables. Most of the hard work is really arithmetic with funny letters. I recommend going and seeing if he did get to π. Now, this formula is beautiful, at least to my eyes. It’s also gibberish. At least it’s ungrammatical. Mathematicians don’t like to write stuff like “four times infinity”, at least not as more than a rough draft on the way to a real thought. What does it mean to multiply four by infinity? Is arithmetic even a thing that can be done on infinitely large quantities? Among Wronski’s problems is that they didn’t have a clear answer to this. We’re a little more advanced in our mathematics now. We’ve had a century and a half of rather sound treatment of infinitely large and infinitely small things. Can we save Wronski’s work? Now the hard part. All those infinities. I don’t like multiplying by infinity. I don’t like dividing by infinity. I really, really don’t like raising a quantity to the one-over-infinity power. Most mathematicians don’t. We have a tool for dealing with this sort of thing. It’s called a “limit”. I’m going to use ‘x’ for the independent variable. It’s any number in the domain. I’m going to use ‘a’ for some point. We want to know the limit of the function “at a”. ‘a’ might be in the domain. But — and this is genius — it doesn’t have to be. We can talk sensibly about the limit of a function at some point where the function doesn’t exist. We can say “the limit of f at a is the number L”. I hadn’t introduced ‘L’ into evidence before, but … it’s a number. It has some specific set value. Can’t say which one without knowing what ‘f’ is and what its domain is and what ‘a’ is. But I know this about it. Pick any error margin that you like. Call it ε because mathematicians do. However small this (positive) number is, there’s at least one neighborhood in the domain of ‘f’ that surrounds ‘a’. Check every point in that neighborhood other than ‘a’. The value of ‘f’ at all those points in that neighborhood other than ‘a’ will be larger than L – ε and smaller than L + ε.
Yeah, pause a bit there. It’s a tricky definition. It’s a nice common place to crash hard in freshman calculus. Also again in Intro to Real Analysis. It’s not just you. Perhaps it’ll help to think of it as a kind of mutual challenge game. Try this. You draw whatever error bar, as big or as little as you like, around ‘L’. But I always respond by drawing some strip around ‘a’. You then pick absolutely any ‘x’ inside my strip, other than ‘a’. Is f(x) always within the error bar you drew? Suppose f(x) is. Suppose that you can pick any error bar however tiny, and I can answer with a strip however tiny, and every single ‘x’ inside my strip has an f(x) within your error bar … then, L is the limit of f at a. Again, yes, tricky. But mathematicians haven’t found a better definition that doesn’t break something mathematicians need. The ‘lim’ part probably makes perfect sense. And you can see where ‘f’ and ‘a’ have to enter into it. ‘x’ here is a “dummy variable”. It’s the falsework of the mathematical expression. We need some name for the independent variable. It’s clumsy to do without. But it doesn’t matter what the name is. It’ll never appear in the answer. If it does then the work went wrong somewhere. What I want to do, then, is turn all those appearances of ‘∞’ in Wronski’s expression into limits of something at infinity. And having just said what a limit is I have to do a patch job. In that talk about the limit at ‘a’ I talked about a neighborhood containing ‘a’. What’s it mean to have a neighborhood “containing ∞”? The answer is exactly what you’d think if you got this question and were eight years old. The “neighborhood of infinity” is “all the big enough numbers”. To make it rigorous, it’s “all the numbers bigger than some finite number that let’s just call N”. So you give me an error bar around ‘L’. I’ll give you back some number ‘N’. Every ‘x’ that’s bigger than ‘N’ has f(x) inside your error bars. And note that I don’t have to say what ‘f(∞)’ is or even commit to the idea that such a thing can be meaningful. I only ever have to think directly about values of ‘f(x)’ where ‘x’ is some real number. So! First, let me rewrite Wronski’s formula as a function, defined on the real numbers. Then I can replace each ∞ with the limit of something at infinity and … oh, wait a minute. There’s three ∞ symbols there. Do I need three limits? Ugh. Yeah. Probably. This can be all right. We can do multiple limits. This can be well-defined. It can also be a right pain. The challenge-and-response game needs a little modifying to work. You still draw error bars. But I have to draw multiple strips. One for each of the variables. And every combination of values inside all those strips has give an ‘f’ that’s inside your error bars. There’s room for great mischief. You can arrange combinations of variables that look likely to break ‘f’ outside the error bars. So. Three independent variables, all taking a limit at ∞? That’s not guaranteed to be trouble, but I’d expect trouble. At least I’d expect something to keep the limit from existing. That is, we could find there’s no number ‘L’ so that this drawing-neighborhoods thing works for all three variables at once. Without doing the work, my hunch is: this is utter madness. I expect it’s probably possible to make this function take on many wildly different values by the judicious choice of ‘x’, ‘y’, and ‘z’. Particularly ‘y’ and ‘z’. You maybe see it already. If you don’t, you maybe see it now that I’ve said you maybe see it. If you don’t, I’ll get there, but not in this essay. But let’s suppose that it’s possible to make f(x, y, z) take on wildly different values like I’m getting at. This implies that there’s not any limit ‘L’, and therefore Wronski’s work is just wrong. And then I need to take the limit of this at ∞. If Wronski is right, and if I’ve translated him fairly, it’s going to be π. Or something easy to get π from. I hope to get there next week. Anyway. Boyer got to a part about the early 19th century. This was when mathematicians were discovering infinities and infinitesimals are amazing tools. Also that mathematicians should maybe learn if they follow any rules. Because you can just plug symbols in to formulas and grind out what looks like they might mean and get answers. Sometimes this works great. Grind through the formulas for solving cubic polynomials as though square roots of negative numbers make sense. You get good results. Later, we worked out a coherent scheme of “complex-valued numbers” that justified it all. We can get lucky with infinities and infinitesimals, sometimes. I will admit I’m not fond of “real” alternate definitions of π. They seem to me mostly to signal how clever the definition-originator is. The only one I like at all defines π as the smallest positive root of the simple-harmonic-motion differential equation. (With the right starting conditions and all that.) And I’m not sure that isn’t “circumference over diameter” in a hidden form. And yes, that definition is a mess of early-19th-century wild, untamed casualness in the use of symbols. But I admire the crazypants beauty of it. If I ever get a couple free hours I should rework it into something grammatical. And then see if, turned into something tolerable, Wronski’s idea is something even true. Boyer allows that “perhaps” because of the strange notation and “bizarre use of the symbol ∞” Wronski didn’t make much headway on this point. I can’t fault people for looking at that and refusing to go further. But isn’t it enchanting as it is? We come now almost to the end of the Summer 2017 A To Z. Possibly also the end of all these A To Z sequences. Gaurish of, For the love of Mathematics, proposed that I talk about the obvious logical choice. The last promising thing I hadn’t talked about. I have no idea what to do for future A To Z’s, if they’re even possible anymore. But that’s a problem for some later time. Art courtesy of Thomas K Dye, creator of the web comic Newshounds . He has a Patreon for those able to support his work. 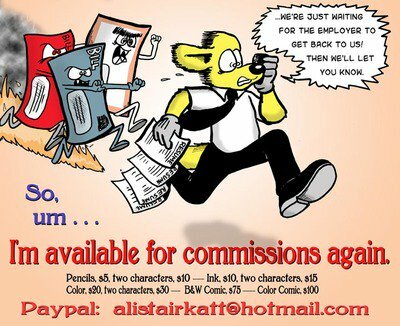 He’s also open for commissions, starting from US$10. Some good advice that I don’t always take. When starting a new problem, make a list of all the things that seem likely to be relevant. Problems that are worth doing are usually about things. They’ll be quantities like the radius or volume of some interesting surface. The amount of a quantity under consideration. The speed at which something is moving. The rate at which that speed is changing. The length something has to travel. The number of nodes something must go across. Whatever. This all sounds like stuff from story problems. But most interesting mathematics is from a story problem; we want to know what this property is like. Even if we stick to a purely mathematical problem, there’s usually a couple of things that we’re interested in and that we describe. If we’re attacking the four-color map theorem, we have the number of territories to color. We have, for each territory, the number of territories that touch it. Next, select a name for each of these quantities. Write it down, in the table, next to the term. The volume of the tank is ‘V’. The radius of the tank is ‘r’. The height of the tank is ‘h’. The fluid is flowing in at a rate ‘r’. The fluid is flowing out at a rate, oh, let’s say ‘s’. And so on. You might take a moment to go through and think out which of these variables are connected to which other ones, and how. Volume, for example, is surely something to do with the radius times something to do with the height. It’s nice to have that stuff written down. You may not know the thing you set out to solve, but you at least know you’ve got this under control. I recommend this. It’s a good way to organize your thoughts. It establishes what things you expect you could know, or could want to know, about the problem. It gives you some hint how these things relate to each other. It sets you up to think about what kinds of relationships you figure to study when you solve the problem. It gives you a lifeline, when you’re lost in a sea of calculation. It’s reassurance that these symbols do mean something. Better, it shows what those things are. I don’t always do it. I have my excuses. If I’m doing a problem that’s very like one I’ve already recently done, the things affecting it are probably the same. The names to give these variables are probably going to be about the same. Maybe I’ll make a quick sketch to show how the parts of the problem relate. If it seems like less work to recreate my thoughts than to write them down, I skip writing them down. Not always good practice. I tell myself I can always go back and do things the fully right way if I do get lost. So far that’s been true. So, the names. Suppose I am interested in, say, the length of the longest rod that will fit around this hallway corridor. Then I am in a freshman calculus book, yes. Fine. Suppose I am interested in whether this pinball machine can be angled up the flight of stairs that has a turn in it Then I will measure things like the width of the pinball machine. And the width of the stairs, and of the landing. I will measure this carefully. Pinball machines are heavy and there are many hilarious sad stories of people wedging them into hallways and stairwells four and a half stories up from the street. But: once I have identified, say, ‘width of pinball machine’ as a quantity of interest, why would I ever refer to it as anything but? This is no dumb question. It is always dangerous to lose the link between the thing we calculate and the thing we are interested in. Without that link we are less able to notice mistakes in either our calculations or the thing we mean to calculate. Without that link we can’t do a sanity check, that reassurance that it’s not plausible we just might fit something 96 feet long around the corner. Or that we estimated that we could fit something of six square feet around the corner. It is common advice in programming computers to always give variables meaningful names. Don’t write ‘T’ when ‘Total’ or, better, ‘Total_Value_Of_Purchase’ is available. Why do we disregard this in mathematics, and switch to ‘T’ instead? First reason is, well, try writing this stuff out. Your hand (h) will fall off (foff) in about fifteen minutes, twenty seconds. (15′ 20”). If you’re writing a program, the programming environment you have will auto-complete the variable after one or two letters in. Or you can copy and paste the whole name. It’s still good practice to leave a comment about what the variable should represent, if the name leaves any reasonable ambiguity. Another reason is that sure, we do specific problems for specific cases. But a mathematician is naturally drawn to thinking of general problems, in abstract cases. We see something in common between the problem “a length and a quarter of the length is fifteen feet; what is the length?” and the problem “a volume plus a quarter of the volume is fifteen gallons; what is the volume?”. That one is about lengths and the other about volumes doesn’t concern us. We see a saving in effort by separating the quantity of a thing from the kind of the thing. This restores danger. We must think, after we are done calculating, about whether the answer could make sense. But we can minimize that, we hope. At the least we can check once we’re done to see if our answer makes sense. Maybe even whether it’s right. For centuries, as the things we now recognize as algebra developed, we would use words. We would talk about the “thing” or the “quantity” or “it”. Some impersonal name, or convenient pronoun. This would often get shortened because anything you write often you write shorter. “Re”, perhaps. In the late 16th century we start to see the “New Algebra”. Here mathematics starts looking like … you know … mathematics. We start to see stuff like “addition” represented with the + symbol instead of an abbreviation for “addition” or a p with a squiggle over it or some other shorthand. We get equals signs. You start to see decimals and exponents. And we start to see letters used in place of numbers whose value we don’t know. There are a couple kinds of “numbers whose value we don’t know”. One is the number whose value we don’t know, but hope to learn. This is the classic variable we want to solve for. Another kind is the number whose value we don’t know because we don’t care. I mean, it has some value, and presumably it doesn’t change over the course of our problem. But it’s not like our work will be so different if, say, the tank is two feet high rather than four. Is there a problem? If we pick our letters to fit a specific problem, no. Presumably all the things we want to describe have some clear name, and some letter that best represents the name. It’s annoying when we have to consider, say, the pinball machine width and the corridor width. But we can work something out. But what about general problems? Is an easy problem to solve? If we want to figure what ‘m’ is, yes. Similarly ‘y’. If we want to know what ‘b’ is, it’s tedious, but we can do that. If we want to know what ‘e’ is? Run and hide, that stuff is crazy. If you have to, do it numerically and accept an estimate. Don’t try figuring what that is. And so we’ve developed conventions. There are some letters that, except in weird circumstances, are coefficients. They’re numbers whose value we don’t know, but either don’t care about or could look up. And there are some that, by default, are variables. They’re the ones whose value we want to know. It’s not a bad approach. Besides the mnemonic value of consonant-coefficient, vowel-variable, it’s true that we usually have fewer variables than anything else. The more variables in a problem the harder it is. If someone expects you to solve an equation with ten variables in it, you’re excused for refusing. So five or maybe six or possibly seven choices for variables is plenty. But it’s not what we settled on. René Descartes had a better idea. He had a lot of them, but here’s one. Use the letters at the end of the alphabet for the unknowns. Use the letters at the start of the alphabet for coefficients. And that is, roughly, what we’ve settled on. In my example nightmare equation, we’d suppose ‘y’ to probably be the variable we want to solve for. And so, and finally, x. It is almost the variable. It says “mathematics” in only two strokes. Even π takes more writing. Descartes used it. We follow him. It’s way off at the end of the alphabet. It starts few words, very few things, almost nothing we would want to measure. (Xylem … mass? Flow? What thing is the xylem anyway?) Even mathematical dictionaries don’t have much to say about it. The letter transports almost no connotations, no messy specific problems to it. If it suggests anything, it suggests the horizontal coordinate in a Cartesian system. It almost is mathematics. It signifies nothing in itself, but long use has given it an identity as the thing we hope to learn by study. And pirate treasure maps. I don’t know when ‘X’ became the symbol of where to look for buried treasure. My casual reading suggests “never”. Treasure maps don’t really exist. Maps in general don’t work that way. Or at least didn’t before cartoons. X marking the spot seems to be the work of Robert Louis Stevenson, renowned for creating a fanciful map and then putting together a book to justify publishing it. (I jest. But according to Simon Garfield’s On The Map: A Mind-Expanding Exploration of the Way The World Looks , his map did get lost on the way to the publisher, and he had to re-create it from studying the text of Treasure Island . This delights me to no end.) It makes me wonder if Stevenson was thinking of x’s service in mathematics. But the advantages of x as a symbol are hard to ignore. It highlights a point clearly. It’s fast to write. Its use might be coincidence. But it is a letter that does a needed job really well. The slightest thing I learned in the most recent set of essays is that I somehow slid from the descriptive “End Of 2016” title to the prescriptive “End 2016” identifier for the series. My unscientific survey suggests that most people would agree that we had too much 2016 and would have been better off doing without it altogether. So it goes. The most important thing I learned about this is I have to pace things better. The A To Z essays have been creeping up in length. I didn’t keep close track of their lengths but I don’t think any of them came in under a thousand words. 1500 words was more common. And that’s fine enough, but at three per week, plus the Reading the Comics posts, that’s 5500 or 6000 words of mathematics alone. And that before getting to my humor blog, which even on a brief week will be a couple thousand words. I understand in retrospect why November and December felt like I didn’t have any time outside the word mines. I’m not bothered by writing longer essays, mind. I can apparently go on at any length on any subject. And I like the words I’ve been using. My suspicion is between these A To Zs and the Theorem Thursdays over the summer I’ve found a mode for writing pop mathematics that works for me. It’s just a matter of how to balance workloads. The humor blog has gotten consistently better readership, for the obvious reasons (lately I’ve been trying to explain what the story comics are doing), but the mathematics more satisfying. If I should have to cut back on either it’d be the humor blog that gets the cut first. Another little discovery is that I can swap out equations and formulas and the like for historical discussion. That’s probably a useful tradeoff for most of my readers. And it plays to my natural tendencies. It is very easy to imagine me having gone into history than into mathematics or science. It makes me aware how mediocre my knowledge of mathematics history is, though. For example, several times in the End 2016 A To Z the Crisis of Foundations came up, directly or in passing. But I’ve never read a proper history, not even a basic essay, about the Crisis. I don’t even know of a good description of this important-to-the-field event. Most mathematics history focuses around biographies of a few figures, often cribbed from Eric Temple Bell’s great but unreliable book, or a couple of famous specific incidents. (Newton versus Leibniz, the bridges of Köningsburg, Cantor’s insanity, Gödel’s citizenship exam.) Plus Bourbaki. That’s not enough for someone taking the subject seriously, and I do mean to. So if someone has a suggestion for good histories of, for example, how Fourier series affected mathematicians’ understanding of what functions are, I’d love to know it. Maybe I should set that as a standing open request. The third leg, I’d say, is differential equations. That’s a fantastic field, but it’s hard to describe without equations. Also pictures of what the equations imply. I’ve tended towards essays with few equations and pictures. That’s my laziness. Equations are best written in LaTeX, a typesetting tool that might as well be the standard for mathematicians writing papers and books. While WordPress supports a bit of LaTeX it isn’t quite effortless. That comes back around to balancing my workload. I do that a little better and I can explain solving first-order differential equations by integrating factors. (This is a prank. Nobody has ever needed to solve a first-order differential equation by integrating factors except for mathematics majors being taught the method.) But maybe I could make a go of that. I’m not setting any particular date for the next A-To-Z, or similar, project. I need some time to recuperate. And maybe some time to think of other running projects that would be fun or educational for me. There’ll be something, though.